Jane Dempsey, top left in 1979, has organized Derby junkets for years. 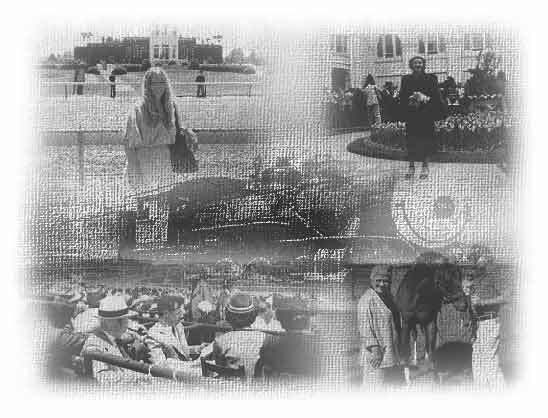 Her mother, Ruth Dempsey Pyle, top right, and Dempsey family, bottom left at 1951 Derby, traveled to Churchill Downs by train, long before junketeer Ruth Turner saw Secretariat in 1986. Louisville, KY – Imagine, if you can, watching Swaps win the Kentucky Derby and then riding with him from Louisville to Los Angeles. This happened in 1955 for dozens of Angelinos who attended Churchill Downs in the Dempsey Derby Tours, which will mark its 50th year at Saturday’s Derby. “This was the biggest thrill”, Ruth Dempsey Pyle wrote in a memoir, before her death in 1993. “I think our group made the loudest roar in the crowd for the California horse. Then Rex and Nola Ellsworth (the owners of Swaps) returned from Kentucky with us, and their horse came along, in his own private railroad car”. 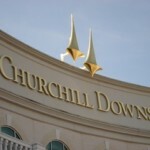 What began, eight years before Swaps, with eight Los Angeles couples writing President Matt Winn of Churchill Downs for tickets and then booking a private railroad car to Louisville, has evoked into an annual Derby tour that brings people her from all over the country. A threatened rail strike in 1964 pushed the Junketeers into the airplane age and they have been arriving by plane ever since. Pyle’s daughter, Jane Dempsey of Santa Monica, has been running the junkets for many years. This week’s tour, which includes a front-row look at Wednesday’s night post-position draw, a visit to the Kentucky Derby Museum, an Ohio River cruise on the Star of Louisville and a trip to the breeding farms in nearby Lexington, KY, is obviously much more than the two minutes or so of the Derby race. Ruth Dempsey’s recollections leave the impression that the good old days of riding the rails had a charm and innocence that won’t be recaptured. In 1955, Mesh Tenney, heading the advice of the late Oscar Otis of the Daily Racing Form, stayed close to his horse at Churchill Downs, even occasionally sleeping with Swaps in his stall. The race won, Tenney stayed with Swaps in the railcar for most of the 1,700-mile trip home. During one stop, the junketeers went back to see the colt and found that his handlers had painted ”Swaps – Winner of the 1955 Kentucky Derby” on the side of the car. The railroad didn’t press charges. From Union Station in Los Angeles, Swaps’ was transferred to another track for his direct shipment to Hollywood Park, where he continued his career. 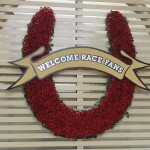 By train or by plane, an appreciation of the horse – any horse that makes it to the Derby – shines through. One of the magazines that Peed, and her husband, Joe, publish is Equine Images, but Peed had never made a bet at a track until 1990, when Unbridled and Summer Squall ran 1-2. Sue Peed who bet a 3-7-11 exacta box because they are he lucky numbers, cashed a $65.80 ticket, but the best was to come in her next Derby trip. In 1992, when Lil E. Tee and Casual Lies, both longshots, reached the wire first, that exacta payoff worth $854.40 for a $2.00 ticket. Peed may have used some of her winnings to buy a new hat. “I got so excited that I sat on mine and crushed it,” she said. Ah, yes, the hats. For a woman, the hat is more de rigueur than those watered down juleps on Derby Day. (A man who tells you he got drunk on mint juleps is not an honest man.) In 1992, there was a cloudburst after the Derby, and the pressure was on Roger Claus of Arcadia to preserve several hats as his crowd walked through the brickyard clubhouse to the tour bus. Among the stallions, the Dempsey crew will see this week are Wild Again, Rahy, and Seattle Slew. The 1977 Triple Crown champion at Three Chimneys Farm; and Go For Gin, the 1994 Kentucky Derby winner, and Mr. Prospector at Claiborne Farm. They might even see an actual breeding, which sometimes has happened in other years. The stallion most veteran junketeers talk about is Secretariat, the 1973 Triple champion who was 19 when he died in 1989. Ruth and Bob Turner once had a streak of attending 10 consecutive Derbies. Besides Secretariat, another lasting memory is “Dawn at the Downs,” an early-morning breakfast in front of the Derby horses going through their final workouts. The Dempsey Tours honored Dave Markson, a singer and recording executive form South Lake Tahoe, NV with a plaque in 1989. Markson was that year’s junketeer with the most Derby trips to his credit. 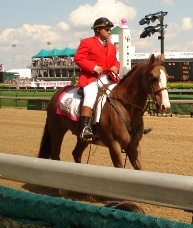 This year will be Markson’s ninth trip to the Derby. 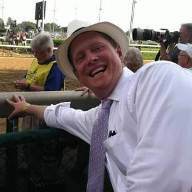 “My mother was from Lexington,” said Markson, who’ll be attending this Derby with wife Sonia. “But she moved to California long ago and always said that she’d never get to a Kentucky Derby. But we got her there several times before she died and she and my Dad were kicking and screaming the year Sunday Silence won. My father once had a choice of delivering some flowers to a cemetery or go to Hollywood Park and he went to Hollywood Park. Markson listens to the trainers and Sue Peed bets her favorite numbers, but Barbara Claus has another system. She bets every horse in the Derby. Stevens also won last year with Thunder Gulch. The Clauses have owner horses, and so has Lorraine Corradini, whose family was involved in the Vern Winchell partnership that raced Tight Spot, the champion grass horse in 1991. Some find the post-position draw over-rated and perhaps a non-event, but not Corradini. There’s another pre-Derby ritual that also has its moments – the playing and singing of “My Old Kentucky Home” during the post parade.